Friday I went to a funeral. The last funeral I attended was my son’s. My dear friend’s mother died recently. Stolen away much too quickly by lung cancer. I wanted to be there, to say good-bye to someone I had known since primary school and to comfort my friend. I had avoided funerals up to that point. Afraid that they would be too painful to bear. There were tears. For my friend. For her Mum. And, although I tried to avoid it, for Xavier. Folding service booklets threw me back to book I made for Xavier. The hours and hours and hours I spent crafting it. Consumed by making things perfect. Shutting everything else out and trying to claim him back through a service booklet. There was no estate to manage. No multitude of albums, journals and personal mementos to sort through. Just two weeks and a service. 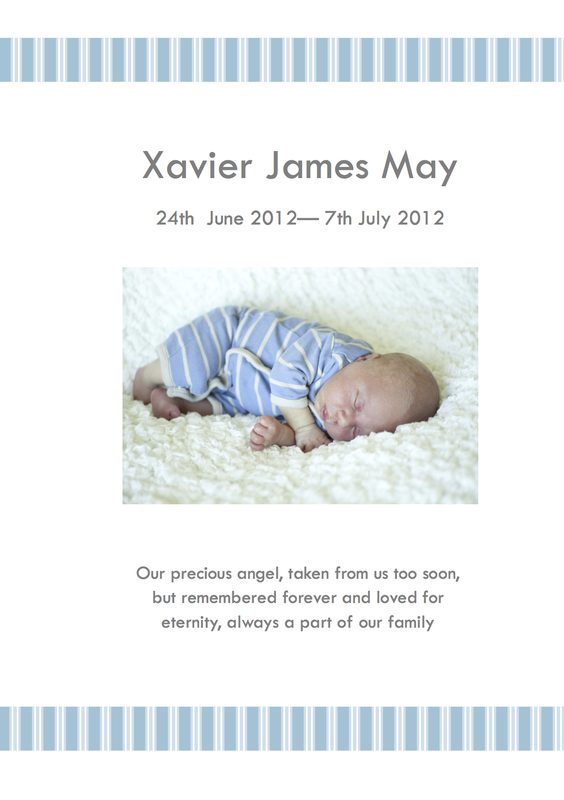 I thought I might share it here: Xavier’s Service. My friend talked about her mother. Initially, her voice broke but it gained strength as she spoke about her mother’s fun loving spirit and unmatched generosity. I was proud of her. I remembered the speech I gave about Xavier. The small snatches of his tiny life that I could share. The way that I practised in front of a mirror so many times so that I could speak without tears. The way that Isaac came up to the lecturn and comforted me as I spoke about his little brother. Images of my friend’s mum were shown in the church. Photos of her as a child, as a young woman, as a young mother holding her baby, as an older mother at her daughter’s wedding, as a grandmother to four beautiful children. A life told in pictures. I remembered the slide show at Xavier’s funeral. The kinds of pictures that you take of a newborn baby, with no thought they might be used to commemorate a life. The heart breaking sadness of a photo of Xavier cuddled into his father’s chest coupled with words “and your Daddy’s here” as Beautiful, Beautiful boy played. The funeral I attended Friday was sad. All funerals are. But it held an element of celebration. There were memories and funny stories to share. There was light in that room, as well as the inevitable sadness. The weight of sadness at Xavier’s funeral was almost impossible to bear. The room drowned in it. I saw my friends and family try desperately to fight tears. Trying to be strong as they thought we were being. We were not strong. We were mute by shock. But in truth, I wanted them to wail. To feel even the smallest edge of my pain. On Friday, the priest talked of this life preparing us for the next. I thought of my little boy, of my friend’s mother and hoped that they had somehow united. Never having met in this world, but desperately missed by some of the same people on earth.